The vibrant color and perky personality of Gerbera daisies makes them an ideal choice for any special occasion – from black tie formal to garden party casual. These Gerberas in light pink will add a splash of sweet color to any space, and they look fantastic as single stems or when mixed with other colors or flower varieties. Your daisies are picked at just the right moment, custom-packaged, and air-shipped that same day to arrive in all their glory direct from the grower, ensuring you flowers that are the most exquisite and longest lasting you’ll find anywhere. Center of the flower is black, dark brown or yellow/green. We cannot guarantee the center color. Prepare your flower containers by cleaning them with mild soap and a drop of bleach or by using disinfecting wipes. This will clean any residues and kill bacteria that might shorten the life of the Gerberas. Glass and plastic are the best materials to contain flowers. 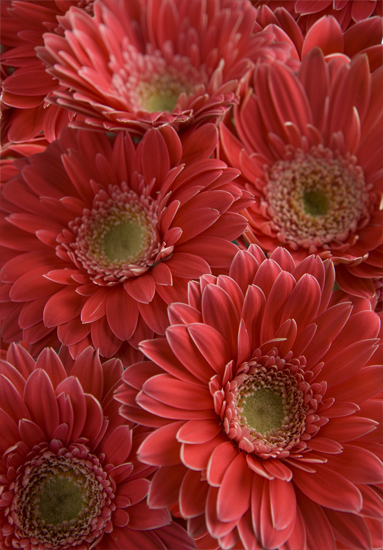 We do not recommend placing Gerberas directly into containers that are metal, rusted, or made of clay or stone. These materials are porous and may contain harmful elements to your flowers. Fill containers with room temperature water. Cold water is not readily absorbed and hot water can shock the flower. The stem of the Gerbera daisy will decompose quickly in deep water so fill your container(s) with only four to five inches of water. Remove the protective flower nets that cover the flower head on each stem. We recommend trimming the flowers underwater. Take about ½” from the bottom of each stem by making a diagonal cut. Immediately place the Gerberas in your prepared flower container. Support the flower head while hydrating for several hours. This can be done by placing a grid over your container, so that the heads are supported and the stems hang free in the water. The plastic tubes on the stems may be left on until you are ready to begin arranging. The temperature in which you store your flowers is very important. The flowers last best in temperatures around 45 degrees. Keep flowers out of direct light in a place with good air circulation. Gerberas should be kept away from fruits and vegetables which produce ethylene gas which can compromise the flower’s vase life. Do not store in the refrigerator. Cigarette smoking is harmful to flowers. When arranging, you can support the stem of the Gerbera daisy with floral wire if the flowers’ stem is naturally curved or bent.